For anyone who looking to find that ideal career choice that is the perfect blend of medicine, science, technology, and public service, a job in ultrasound diagnostics may be the perfect option. Anyone studying to be a sonographer right now, or working in the field currently, is working in one of the fastest growing careers across the nation. And, trends show that the job growth expectations won’t be changing any time soon. And, if you’re one of the countless individuals considering a future career in sonography, here are 10 great reasons that Ultrasound Diagnostics is growing so rapidly in the U.S. If you’re interested in a career in diagnostic imaging, sonography is a great career choice because it’s safe, non-invasive, and low-risk. As opposed to other career paths in this line of medicine, sonographers and their patients aren’t exposed to harmful radiation day after day. This means that any harmful side effects are rare. 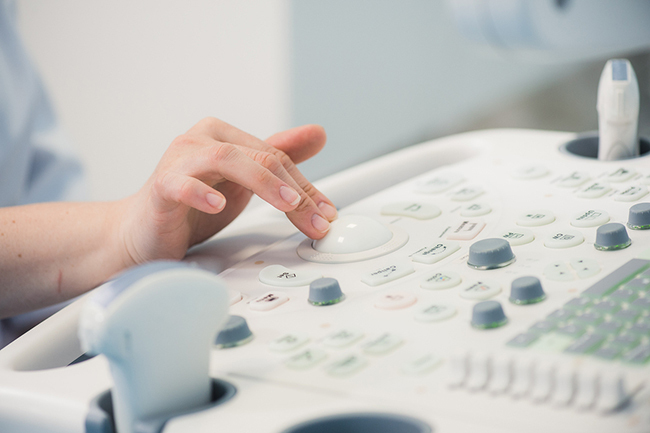 Most people probably think of babies and OB/GYN offices when the word “ultrasound” comes up. But in reality, there are many ultrasound specialties to choose from. They include abdominal sonography, cardiovascular sonography, mammography, ophthalmic sonography and obstetrics/gynecologic sonography. And with so many specialties to consider, there are a variety of work environments available to consider too. Sonographers may work in hospitals, private physicians’ offices, clinics, labs, and other medical facilities. For those interested in a career in the medical field who may be a tad queasy, sonography is a great career option. Sonographers can’t fully escape blood, broken bones and other medical situations that may be “gross”, but when compared to the responsibilities of doctors, nurses and medical assistants, the daily ick-factor is minimal for sonographers. As reported to the Bureau of Labor Statistics, Diagnostic Medical Sonography is expected to grow by more than 26% nationally through the year 2024. Compare this to the occupational career growth average of 6.5% annually and the difference is astounding. The field is competitive, but the opportunities abound in every region of the nation. More and more medical care providers are opting for ultrasound technology over other diagnostic imaging options because it is less expensive and the equipment is becoming more mobile and easier to obtain and operate than other imaging choices. As the demand for sonographers continually increases, job openings arise. This enormous generation of individuals born between 1946 and 1964 is living longer and longer. With more than 76 million people who fit in this category, that means there is a huge population of patients in need of ongoing medical care. Ultrasound technology is a vital component to the diagnosis and treatment that these individuals will need. On average, sonographers earn an annual salary of around $65,000. Of course, pay rates will vary due to the level of experience, location, and specialty focus, but even the low end of the spectrum offers a great starting pay rate for those just starting out. Many of the responsibilities that sonographers have extended beyond performing ultrasounds. Cataloging and ordering equipment, managing other staff positions and other related tasks often provide the valuable experience necessary for other job opportunities. Compared to many other Allied Health careers, sonography programs can effectively train individuals in just one or two years. Some programs require additional training, but typically, sonographers can complete their training and start their careers in a relatively short amount of time. Sonographers don’t get stuck working behind a desk all day. They get to work with some of the most innovative technology every day. As technology changes, training continue. Sonography offers an exciting medical career option for anyone who loves working with high-end technology day after day. The 2016 Jobs Rated report studied 200 tracked jobs and rated them on the level of stress their worker’s experience. Ultrasound techs are among the top ten careers with the lowest amounts of daily stress. Although the job may be a calm one, a sonographer’s work day is definitely not a boring one. Who wouldn’t love a career that allows them to make a difference in other people’s lives, is filled with unexpected experiences AND is low-stress day after day? At the Institute of Ultrasound Diagnostics, we pride ourselves in being one of the nation’s few schools that offers an intensive, accelerated program for students both locally and nationally through resident and Distance learning opportunities. Now is the time to join the thousands of sonographers nationwide in this exciting career. Contact IUD today for more information.